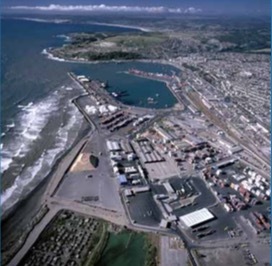 In Chile, the Port of San Antonio’s bulk terminal, Puerto Panul, has beaten all previous records in respect of dry bulk traffic. It closed the year having handled 2.6mt (million tonnes), equivalent to growth of 7%. Indeed, the terminal had, by November, handled as much traffic as it had in the whole of 2014. According to managing director David Ferna´ndez, the operator now handles 95% of all imported clean bulks, such as wheat, corn, soya and fertilizers. In 2016, the aim is to install conveyors to handle export bulk, which should allow the terminal to handle up to 3mt, much of which will be heading for Asian markets. In total, Puerto Panul will invest $3 million to put the new export conveyor and a stacker- reclaimer systems into operation. Quizzed us to how the terminal had been able to produce such good results in the face of difficult trading conditions, Ferna´ndez attributed it to both animal grain and grain bound for processing plants. He pointed out that, in general, this market tends to be more resistant to economic variations, given that is connected with animal and human food consumption. Despite having just a single berth, which is operating at high levels of capacity, the terminal has been able to increase throughput, too, thanks to speeding up handling activities. According to Ferna´ndez, this has been in the form of integrated logistics, which has resulted in consignments being shipped out of the port rapidly by either truckle train. In 2016, $3 million is to be invested in upgrades, which should allow traffic to increase from 2.7mt to 3mt.